The Adventure Kids look at the fascinating and highly lucrative world of thoroughbred breeding at the Irish National Stud in Kildare, Ireland where racing legends are born. 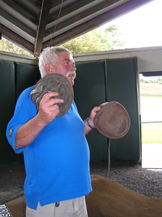 In September 2007, we visited the Irish National Stud, the only stud farm open to the public, to learn about thoroughbred breeding, and a day spent in the company of our guide, Tony, who has worked at the facility for over 12 years, was indeed an enlightening process. If you have always dreamed of owning a thoroughbred, or just love horses, then a visit to the Irish National Stud should be a requirement of a trip to Ireland. For starters, the grounds are immaculate with beautiful gardens, and the horses are sensationally handsome creatures. Everything has a season, and for thoroughbred horses, the breeding season begins on the romantic day of the 14th February 14, and closes at the end of May. This is because the official calendar year for horses states that on January 1 all horses born the previous year become yearlings, and the following January, the horses become two-year olds and are now of race age. 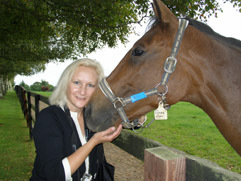 Horses have a gestation period of 11 months with foaling (delivery) taking place between February and April. An interesting statistic is that 65% of horses born in April have been winners. However, the calendar for the Southern Hemisphere is August 1, so two of the top stallions at the Irish National Stud become "Shuttle Studs" flying via Jumbo Jet to Australia and New Zealand where they remain from September until December for mares not able to travel to Ireland. For thoroughbred horses, artificial insemination is illegal, and thus a highly specialized orchestration is required for breeding. However, before we begin, we should discuss some terms used in the breeding process; to begin with, when horses mate it is a called a "cover", and the "cover" that the stud provides is called a "nomination." The 2007 stallions include Invincible Spirit (Bay 1997, Desert - Rafha by Kris); Verglas (Grey 1994, Highest Honor - Rahaam by Secreto); Medecis (Chestnut 1999, Machiavellian - Renashaan by Darshaan); Indian Haven (Chestnut 2000, Indian Ridge - Madame Dubois by Legend of France); Elusive City (Bay 2000, Elusive Quality - Star of Paris by Dayjur); Celtic Swing (Brown 1992, Damister - Celtic Ring by Welsh Pageant; Rakti (Bay 1999, Polish Precedent - Ragera by Rainbow Quest); and Alamshar (Bay 2000, Key of Luck - Alaiyda by Shahrastani); at the Irish National Stud are retired champions with impeccable pedigrees, and the mares that come to the facility each year travel from all over the world via Jumbo Jets. 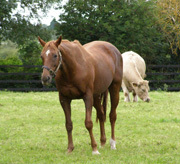 Once they arrive at the Irish National Stud, the intriguing process begins. The first step is to have the mare checked to ensure that she is in "season" and one of the ways that they check is to use what they call a "teaser" horse. Tommy is the official stud teaser at the farm, and it is his job to check if the mare is in season. The mare enters Tommy's paddock where handlers assess if the mare is in season by how Tommy and the mare react to one another. Unfortunately, Tommy only gets to look at the mare through a window, yet judging by how he looks at the mare, he provides the handlers with the information that they require. As Tony explained this process, we could not help but feel a bit sorry for poor Tommy. The nest step in the process is a visit to the veterinarian, and when the best time and date are determined, the handlers bring the mare and the stallion to the covering area or the "honeymoon suite" where they will meet. This area has recycled tire bits to provide a cushioned area for the couple. However, like a bride, certain preparations must be made before the cover can take place, including the removal of the horses' shoes from the back hooves to prevent injury to one another. The mare is brought to one side of a partition by two handlers, and the stallion is brought to the other side by his handlers. When the timing is right, the mare is turned and brought into position, her handlers place special pads over her feet to prevent her from injuring the stallion should she decide to kick him, and her mane is covered to prevent the stallion from biting her mane. To further ensure the legitimacy of the live cover, (not artificial insemination), and to prevent inbreeding, which is also illegal, the cover is videoed and photographed to record and document the parentage. 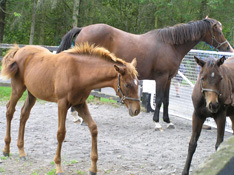 The gestation period for horses is eleven months, and if there is no foal, there is no fee. If the mare is pregnant by October 1, the fee must be paid, however there is no guarantee for a live foal after November. Local mares brought to the Irish National Stud by trailer will return home after the covering process, whereas foreign mares will remain at the farm for three months. When the mare is ready to foal (deliver), she will return to the farm to the foaling area. Foaling usually takes place at night with foaling men who act as midwives to assist in the process. An average weight for a foal is 110 pounds, with a record weight of 146 pounds. Once the foal is born, it will have DNA testing and a microchip inserted into its neck to prove its parentage. The following day the mare and foal move to the nursery area, and before the mare returns home, she will be with foal again. The nursery is probably the most visited area as who could possibly resist the sweet faces of the foals that may become the next racing legends. Horses race for a period of 2-3 years and after they win, they retire and go to stud. The average lifespan of a horse is 21-25 years old (example: Indian Ridge died at the age of 21 years). So, what is the cover fee for a stallion? It depends on the stallion's record of wins that his offspring produce. Every time that one of his offspring wins a race, his fee increases and can range from 5,000 Euros for a young stud to 75,000 Euros for a stud with offspring winners. Example, Verglas' nomination fee is 15,000 Euros, and in one day, he covered five mares, all of which went to foal. Invincible Spirit previously had received 10,000 Euros per mare, however, when 35 of his offspring won (which is a world record) his nomination fee skyrocketed to 35,000 Euros per mare; talk about high finance! As would be expected, these horses are extremely well cared, and as we walked the impressive grounds where each stallion has his own paddock, we noticed cattle in the paddocks, which we thought was rather strange. The reason was actually very sensible; cattle eat long grass, and horses prefer to eat short grass, so the cattle "mow the grass" to the perfect height, in a manner of speaking, for the horses, which are definitely spoiled. After touring the Irish National Stud, we also visited St. Fiachra's Garden, a spiritual garden featuring a statue of Saint Fiachra, the patron saint of gardeners, and the Japanese Gardens, which Colonel William Hall-Walker (later Lord Wavertree) had designed for him between 1906 and 1910. We took a tour of the Japanese Gardens with Jim, the head gardener, who explained the garden which takes the visitor on a journey of life beginning in the Cave of Birth, continuing on to the Tunnel of Ignorance, Path of Adventure, Engagement Bridge, and the Marriage Bridge where we found Mr. Jabu Abraham and his beautiful bride, Mrs. Jennifer Sneyd Abraham, posing for photographs to commemorate their wedding. The garden has a series of steps to climb emulating life with its twists and turns and often two diverging paths where we had to decide which path to take, before continuing on the Bridge of Life, the Well of Wisdom, and culminating in the Hill of Mourning. 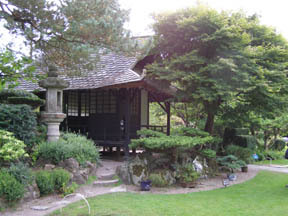 The Zen garden has a peacefulness and tranquility, and features exotic and rare plants some of which are as old or older than the garden itself, and a Japanese Ceremonial Teahouse. 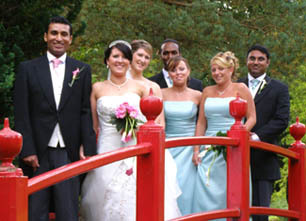 Plan to allow several hours for a visit, as there is so much to experience at the Irish National Stud and its gardens. There is also a restaurant and a gift shop.